"Donnerubin's just had a year off while Jacinda had their second child. He served close to 100 mares over the 2011-12 season. His progeny such remarkable foals that the mare owners just return and year after year. He recommenced work in February 2012 and only a few short weeks later appeared in the Saturday night Extravaganza in the Stallion Display at National Dressage Championships in front of 3,500! Ten days later he appeared in the invitation only Stallion Parade at Horse of the Year show in front of about 5,000. He will recommence his competition career in the 2012-13 season." In 2011, Jacinda and Wayne added to their family in two ways. First with the arrival to NZ of their newest stallion, Rohdinger and secondly with the birth of their second human foal! Rohdinger was specifically chosen for his bloodlines, temperament and conformation, but most importantly his quick light movement and his exceptional ridability (after riding Donnerubin, they just couldn’t got back to anything less!). 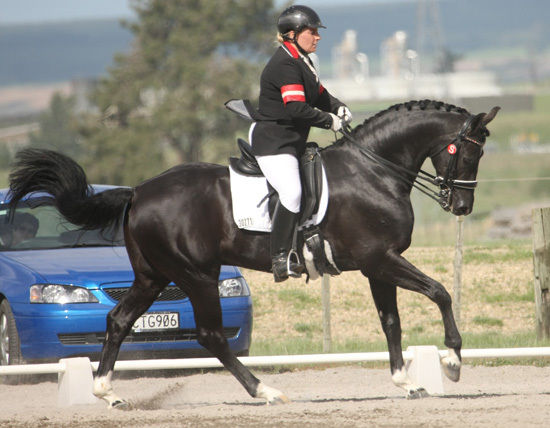 Rohdinger was imported in Utero from Germany and is by the most famous of the Rubinstein sons Rohdiamant, by a Verband State Premium mare by Stedinger out of a Ramiro Z mare. He will make a really exciting cross over the Donnerubin fillys and vice versa. The team at CDS believe this breeding cross might just be the thing to catapult NZ Sporthorse breeding forward by about a decade. It looks to be a really exciting time looking into the future of breeding superstars for our Sport!